Automotive dealerships have had a roller coaster ride in the past few years, with owners having to make hard choices to survive the economic downturn. They’ve additionally had to be more creative in their sales approach, more customer and service friendly as well as take more precautions with securing their inventories. To help solve the issue of improved security and key control for their inventory, many dealerships have upgraded their manual or outdated key control systems with automated key control and management systems with tracking software. 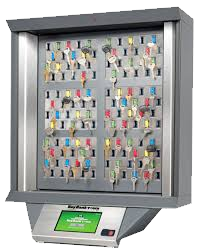 The new systems offer these high-volume key facilities increased security and control by preventing unauthorized key access and reducing lost or misplaced keys. Keys are attached to a locking mechanism that is virtually tamper proof and access and return of keys is electronically monitored. This type of locking system is intended to thwart the thief who would attempt to keep the key after test driving a demo car and replace it with a counterfeit key, the purpose being to return later and drive off with the demo car. In other cases, key banks with electronic monitoring will prevent an employee from inadvertently taking a key home at the end of the day instead of returning it. Key banks can offer further value to the dealership because the systems can also provide management with data regarding the status and location of vehicle inventory. For example, vehicle history reports can be generated to help analyze sales force performance on demos, fast/slow movers and even track the source of mystery mileage. Having easy and reliable access to keys can also help with sales. When keys are stored in a secure, central location, there’s less chance of a customer changing their mind and walking out the door while the sales person quickly retrieves the demo car keys as compared to if that sales person had to run around and look for a set of keys. In tough economic times, key banks are proving to be money in the bank for automotive dealerships. Fleet Management Key Control Where are the Car Keys?